Volume management creates a layer of abstraction over physical storage, allowing you to create logical storage volumes. This provides much greater flexibility in a number of ways than using physical storage directly. In addition, the hardware storage configuration is hidden from the software so it can be resized and moved without stopping applications or unmounting file systems. This can reduce operational costs. When using logical volumes, file systems can extend across multiple disks, since you can aggregate disks and partitions into a single logical volume. You can extend logical volumes or reduce logical volumes in size with simple software commands, without reformatting and repartitioning the underlying disk devices. To deploy newer, faster, or more resilient storage subsystems, you can move data while your system is active. Data can be rearranged on disks while the disks are in use. For example, you can empty a hot-swappable disk before removing it. Logical storage volumes can be managed in user-defined and custom named groups. You can create a logical volume that stripes data across two or more disks. This can dramatically increase throughput. Logical volumes provide a convenient way to configure a mirror for your data. Using logical volumes, you can take device snapshots for consistent backups or to test the effect of changes without affecting the real data. The underlying physical storage unit of an LVM logical volume is a block device such as a partition or whole disk. To use the device for an LVM logical volume, the device must be initialized as a physical volume (PV). Initializing a block device as a physical volume places a label near the start of the device. By default, the LVM label is placed in the second 512-byte sector. You can overwrite this default by placing the label on any of the first 4 sectors when you create the physical volume. This allows LVM volumes to co-exist with other users of these sectors, if necessary. An LVM label provides correct identification and device ordering for a physical device, since devices can come up in any order when the system is booted. An LVM label remains persistent across reboots and throughout a cluster. The LVM label identifies the device as an LVM physical volume. It contains a random unique identifier (the UUID) for the physical volume. It also stores the size of the block device in bytes, and it records where the LVM metadata will be stored on the device. 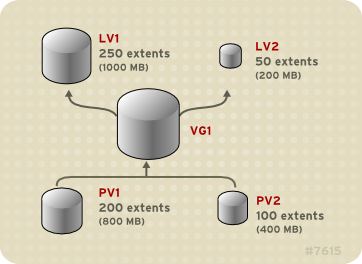 The LVM metadata contains the configuration details of the LVM volume groups on your system. By default, an identical copy of the metadata is maintained in every metadata area in every physical volume within the volume group. LVM metadata is small and stored as ASCII. Currently LVM allows you to store 0, 1 or 2 identical copies of its metadata on each physical volume. The default is 1 copy. Once you configure the number of metadata copies on the physical volume, you cannot change that number at a later time. The first copy is stored at the start of the device, shortly after the label. If there is a second copy, it is placed at the end of the device. If you accidentally overwrite the area at the beginning of your disk by writing to a different disk than you intend, a second copy of the metadata at the end of the device will allow you to recover the metadata. Figure 1.2, “Physical volume layout” shows the layout of an LVM physical volume. 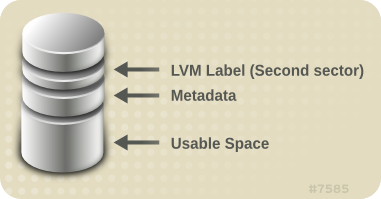 The LVM label is on the second sector, followed by the metadata area, followed by the usable space on the device. In the Linux kernel (and throughout this document), sectors are considered to be 512 bytes in size. It is easier to keep track of the hardware in a system if each real disk only appears once. This becomes particularly true if a disk fails. In addition, multiple physical volumes on a single disk may cause a kernel warning about unknown partition types at boot. LVM cannot tell that two physical volumes are on the same physical disk. If you create a striped logical volume when two physical volumes are on the same physical disk, the stripes could be on different partitions on the same disk. This would result in a decrease in performance rather than an increase. Although it is not recommended, there may be specific circumstances when you will need to divide a disk into separate LVM physical volumes. For example, on a system with few disks it may be necessary to move data around partitions when you are migrating an existing system to LVM volumes. Additionally, if you have a very large disk and want to have more than one volume group for administrative purposes then it is necessary to partition the disk. If you do have a disk with more than one partition and both of those partitions are in the same volume group, take care to specify which partitions are to be included in a logical volume when creating striped volumes. Physical volumes are combined into volume groups (VGs). This creates a pool of disk space out of which logical volumes can be allocated. Within a volume group, the disk space available for allocation is divided into units of a fixed-size called extents. An extent is the smallest unit of space that can be allocated. Within a physical volume, extents are referred to as physical extents. A logical volume is allocated into logical extents of the same size as the physical extents. The extent size is thus the same for all logical volumes in the volume group. The volume group maps the logical extents to physical extents. Creating a linear volume assigns a range of physical extents to an area of a logical volume in order. 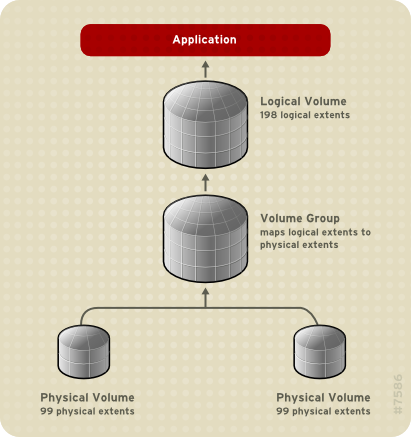 For example, as shown in Figure 1.3, “Extent Mapping” logical extents 1 to 99 could map to one physical volume and logical extents 100 to 198 could map to a second physical volume. From the point of view of the application, there is one device that is 198 extents in size. The physical volumes that make up a logical volume do not have to be the same size. Figure 1.4, “Linear volume with unequal physical volumes” shows volume group VG1 with a physical extent size of 4MB. This volume group includes 2 physical volumes named PV1 and PV2. The physical volumes are divided into 4MB units, since that is the extent size. In this example, PV1 is 200 extents in size (800MB) and PV2 is 100 extents in size (400MB). You can create a linear volume any size between 1 and 300 extents (4MB to 1200MB). In this example, the linear volume named LV1 is 300 extents in size. You can configure more than one linear logical volume of whatever size you require from the pool of physical extents. Figure 1.5, “Multiple logical volumes” shows the same volume group as in Figure 1.4, “Linear volume with unequal physical volumes”, but in this case two logical volumes have been carved out of the volume group: LV1, which is 250 extents in size (1000MB) and LV2 which is 50 extents in size (200MB). Striped logical volumes can be extended by concatenating another set of devices onto the end of the first set. In order to extend a striped logical volume, however, there must be enough free space on the set of underlying physical volumes that make up the volume group to support the stripe. For example, if you have a two-way stripe that uses up an entire volume group, adding a single physical volume to the volume group will not enable you to extend the stripe. Instead, you must add at least two physical volumes to the volume group. RAID logical volumes are not cluster-aware. While RAID logical volumes can be created and activated exclusively on one machine, they cannot be activated simultaneously on more than one machine. If you require non-exclusive mirrored volumes, you must create the volumes with a mirror segment type. Thin volumes provide support for a new implementation of copy-on-write (COW) snapshot logical volumes, which allow many virtual devices to share the same data in the thin pool. Because a snapshot copies only the data areas that change after the snapshot is created, the snapshot feature requires a minimal amount of storage. For example, with a rarely updated origin, 3-5 % of the origin’s capacity is sufficient to maintain the snapshot. You can create LVM volumes for use with Red Hat Virtualization. LVM snapshots can be used to create snapshots of virtual guest images. These snapshots can provide a convenient way to modify existing guests or create new guests with minimal additional storage. You can use the --merge option of the lvconvert command to merge a snapshot into its origin volume. One use for this feature is to perform system rollback if you have lost data or files or otherwise need to restore your system to a previous state. After you merge the snapshot volume, the resulting logical volume will have the origin volume’s name, minor number, and UUID and the merged snapshot is removed. Thin snapshot volumes can be used as a logical volume origin for another snapshot. This allows for an arbitrary depth of recursive snapshots (snapshots of snapshots of snapshots…​). LVM supports the use of fast block devices (such as SSD drives) as write-back or write-through caches for larger slower block devices. Users can create cache logical volumes to improve the performance of their existing logical volumes or create new cache logical volumes composed of a small and fast device coupled with a large and slow device. The following procedures provide examples of basic LVM administration tasks. This example procedure creates an LVM logical volume called mylv that consists of the disks at /dev/sda1, /dev/sdb1, and /dev/sdc1. 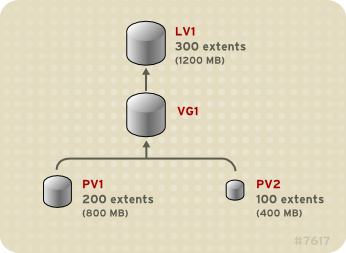 To use disks in a volume group, label them as LVM physical volumes with the pvcreate command. 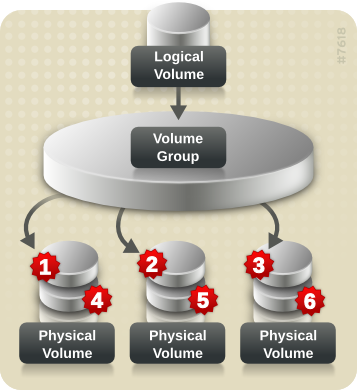 Create the a volume group that consists of the LVM physical volumes you have created. The following command creates the volume group myvg. Create the logical volume from the volume group you have created. The following command creates the logical volume mylv from the volume group myvg. This example creates a logical volume that uses 2 gigabytes of the volume group. Create a file system on the logical volume. The following command creates an ext4 file system on the logical volume. A RAID0 logical volume spreads logical volume data across multiple data subvolumes in units of stripe size. This example procedure creates an LVM RAID0 logical volume called mylv that stripes data across the disks at /dev/sda1, /dev/sdb1, and /dev/sdc1. Label the disks you will use in the volume group as LVM physical volumes with the pvcreate command. Create the volume group myvg. The following command creates the volume group myvg. Create a RAID0 logical volume from the volume group you have created. The following command creates the RAID0 volume mylv from the volume group myvg. This example creates a logical volume that is 2 gigabytes in size, with three stripes and a stripe size of 4 kilobytes. Rounding size 2.00 GiB (512 extents) up to stripe boundary size 2.00 GiB(513 extents). Create a file system on the RAID0 logical volume. The following command creates an ext4 file system on the logical volume. In this example procedure, an existing volume group consists of three physical volumes. If there is enough unused space on the physical volumes, a new volume group can be created without adding new disks. In the initial set up, the logical volume mylv is carved from the volume group myvg, which in turn consists of the three physical volumes, /dev/sda1, /dev/sdb1, and /dev/sdc1. After completing this procedure, the volume group myvg will consist of /dev/sda1 and /dev/sdb1. A second volume group, yourvg, will consist of /dev/sdc1. Use the pvscan command to determine how much free space is currently available in the volume group. Move all the used physical extents in /dev/sdc1 to /dev/sdb1 with the pvmove command. The pvmove command can take a long time to execute. After moving the data, you can see that all of the space on /dev/sdc1 is free. The following command splits the volume group yourvg from the volume group myvg, moving the physical volume /dev/sdc1 into the new volume group yourvg. 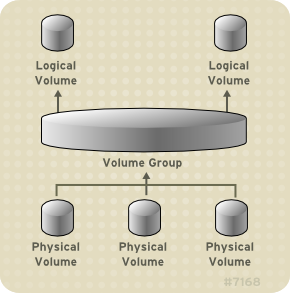 After creating the new volume group, create the new logical volume yourlv. Create a file system on the new logical volume and mount it. These example procedures show how you can remove a disk from an existing logical volume, either to replace the disk or to use the disk as part of a different volume. In order to remove a disk, you must first move the extents on the LVM physical volume to a different disk or set of disks. This examples moves the extents off of /dev/sdb1 so that it can be removed from the volume group. This example procedure moves the extents of /dev/sdb1 to a new device, /dev/sdd1. Add the new physical volume /dev/sdd1 to the existing volume group myvg. Use the pvmove command to move the data from /dev/sdb1 to /dev/sdd1. After you have moved the data off /dev/sdb1, you can remove it from the volume group. You can now reallocate the disk to another volume group or remove the disk from the system.